Alright! I’ve finally finished with the Boolean Function Reducer – BoolCrunch. This is currently a beta. 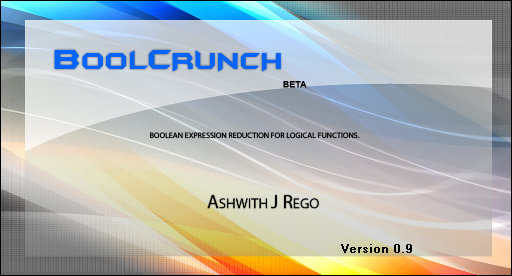 BoolCrunch can minimize Boolean functions and can give you either minterm or maxterm equations. I have written the program using Visual Basic 2008. Supports both Sum of Products and Product of Sums expressions. Allows functions with 1 – 10 variables.